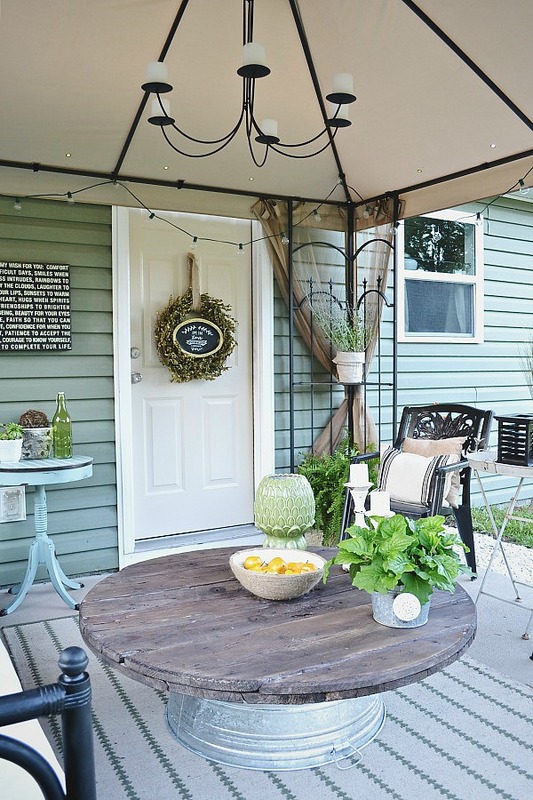 So it’s been about a week since I announced the reveal of our back patio makeover over on the Home Depot website. It was amazing being featured over there & such an honor. Well, now I’m here to chat about the whole space. This patio makeover has been a long time coming. Thank you to Home Depot for motivating me to finally make this a pretty space for our home. Before this space was a just a place to work on all of our DIY projects & it was almost embarrassing for anyone to see our backyard so we never went back there when we had people over. I really wanted to create a cozy space in the backyard that was almost like another room in our home. I wanted to do all of this without spending a whole lot of money. Not too much to ask right? Well, not when you shop thrift stores, make DIY projects, & re-use items from around your home that you aren’t using anymore. & that is exactly what we did to create this outdoor patio space. We are so happy with this space & have used it quite often since it has been finished even though the heat & humidity here in NC has been out of control. But you know what my favorite part is? NO BUGS! One of the main reason we didn’t like using our backyard was the creepy crawlers, but with our gazebo it is really rare that a bug gets in. So nice. There are no regrets about the time it took to make this space what it is today, & we have a few more plans to add more back here, but more on that later. What do you think of the space? 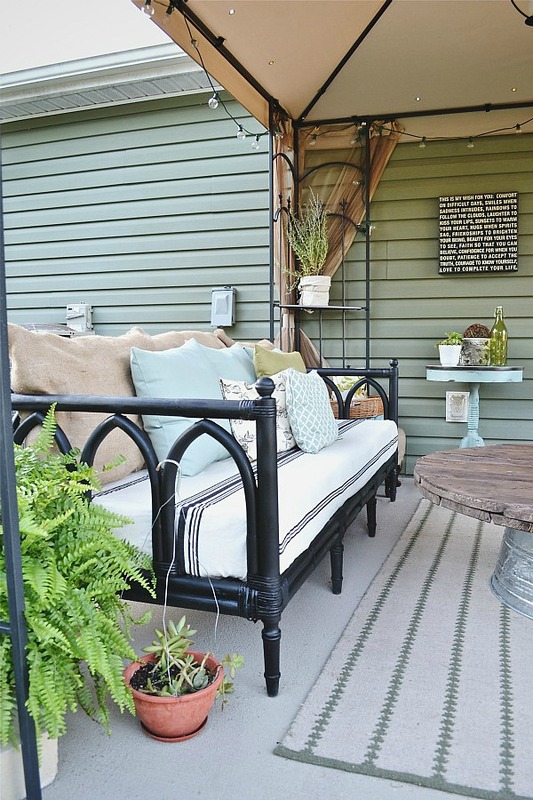 Does your back patio need a little love? I hope you see by this post that you do not need a hug budget to make your space look great. Leave your questions, comments, and thoughts below or find me on facebook or instagram! Awesome transformation… Great job! 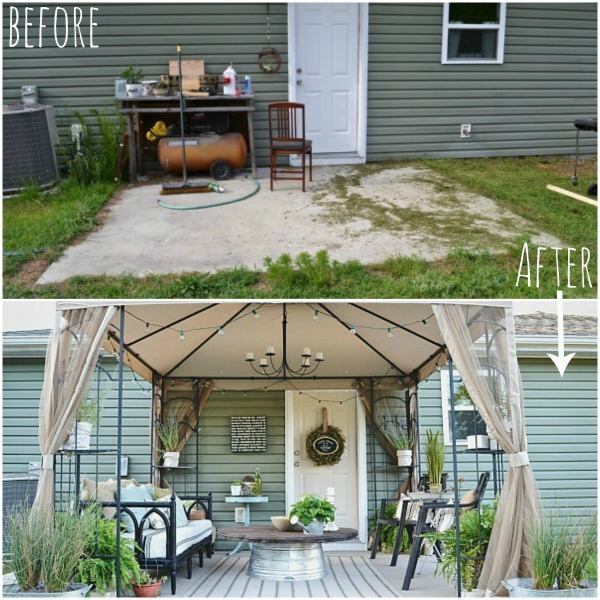 Your before picture is exactly how my patio currently looks so now I have an amazing inspiration for what to do. I have been trying to figure this out for a while so I hope you don’t mind that I am copying all of this! I definitely savored every bit of it and i also have you saved as a favorite to look at new things in your blog. Wow. Fantastic job. This looks amazing! Looks great and so much more functional! 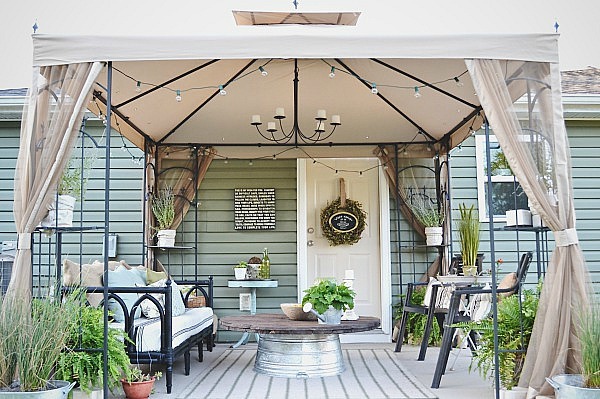 Does the patio cover stay up all summer? What about a bad storm with a lot of wind. Just wondering if it is grounded. What about rain on cushions and mold problems? 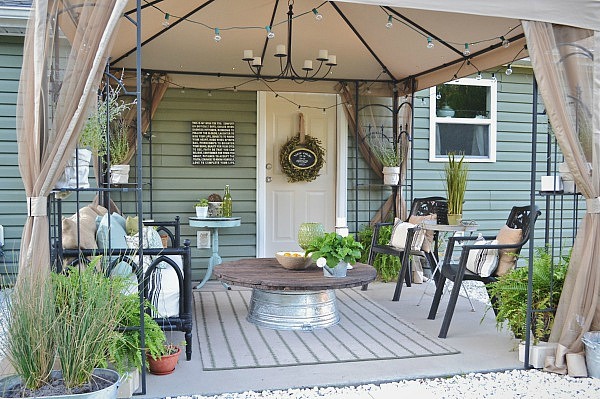 This is beautiful and I have the exact patio which I would love to do this . It looks great! That is so awesome! I am always trying to figure out what to do with our backyard/patio. What is that stuff you used for the ground ?! Is it cement ?! Wow you’ve inspired me. Just came across this on newsletter from Country Living magazine. Know how you felt. I too keep back door shut. I am going out right now to see what i can repurpose, and will check out the local thrift stores. Am very inspired, will be keeping up with your blog from now on. Great ideas and looks amazing. Well done. I live in Australia , so our climate is pretty spot on for lots of outdoor living, hopefully wil be able to get something better in place. All the best. Wish wwe had Home Depot here in Australia ! Love the transformation! Did you happen to paint your concrete patio? If so do you have any tips to share? it to be sure you are losing the most weight at the right time. 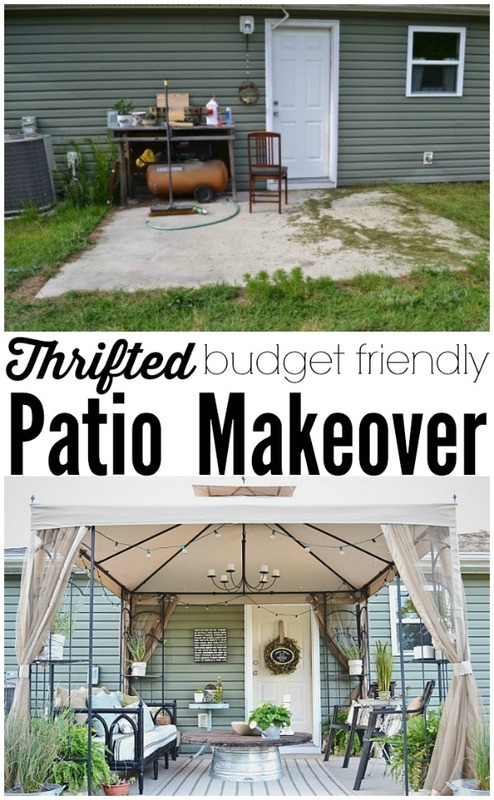 I can’t tell you how much I love this patio makeover. I had a builders slab like this in one house and I’m so sorry I didn’t see your makeover then. I don’t have a slab right now but I do have a bit of concrete and I’m going to pull many, if not all, of your ideas into my yard. I also shared your picture and link on my blog because I know the ladies are going to love it and visit with you. I’m subscribing through Bloglovin’ and look forward to future posts. I have the same problem with my patio space – grass is growing up through the cracks. What did you do to solve that problem? Was the concrete redone? Hi1 I love the rock border, how did you do this and does the grass grow under the rocks?? My partner and I have just been looking at your patio make-over and think it’s great. You should be really proud of achieving such a welcoming and useable space and keeping to a budget. I used to live in California but now live in France. 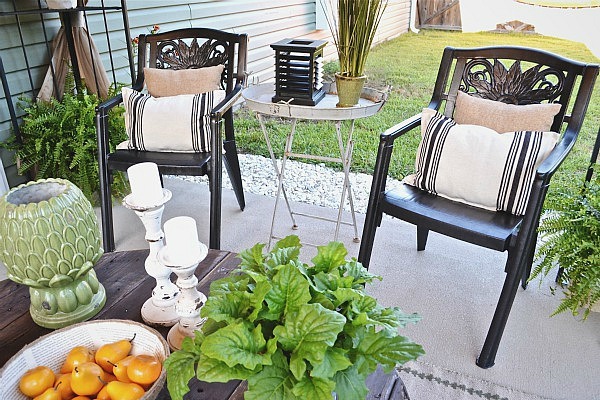 We are busy trying to make our own unloved outdoor space into something lushly green and colourful – also on a budget. You have done a great job on the patio – congratulations! you can be really proud of what you’ve achieved-and all on a budget too. I used to live in California but now live in France where we are doing up an old house. I think good ideas translate no matter where you live and we are busily trying to transform our yard into a lushly colourful place. I just wish we had a Home Base here-it was a big favourite when I lived in San Jose. Thanks for posting your ideas. All good wishes to you; I’ll follow your blog from now on, so keep up the good work! Adding everything up, it looks like you spent between $550-$650. To me that is not budget friendly. That isn’t the kind of money most people have lying around. 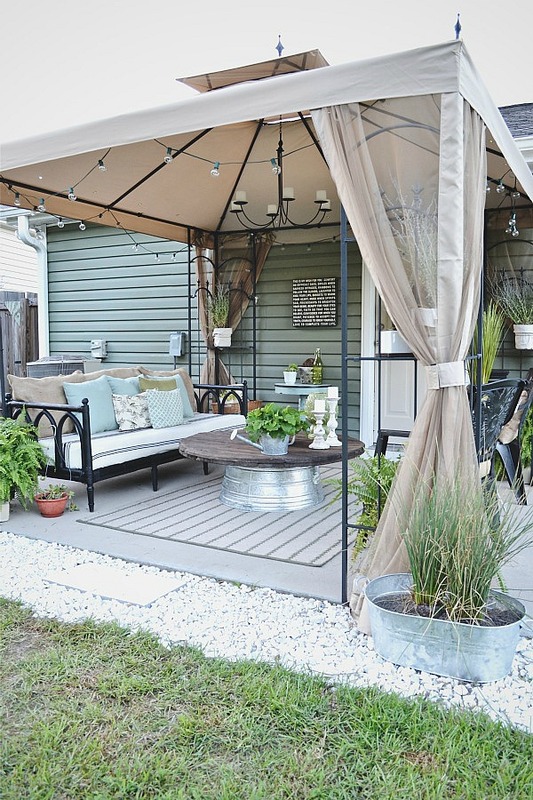 Buying a $200 pergola isn’t exactly thrifty. But I guess “on a budget” doesn’t mean “inexpensive” if you’re rich and have a large budget. Hi! 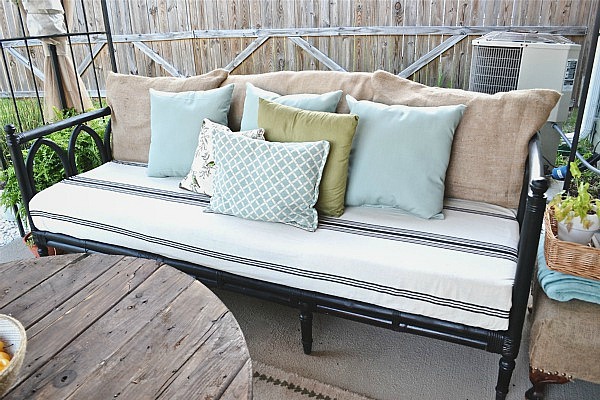 Your outdoor sofa is just what I’ve been looking for for my new screened porch. Do you happen to know what name brand it is? Thanks! Your patio looks really nice after the make over. Completely changed. No doubt, you’ve created a lovely recreation area. 🙂 Congrats. Hey very nice web site!! Guy .. Beautiful .. Amazing .. I will bookmark your web site and take the feeds additionally…I am glad to seek out numerous helpful info right here in the put up, we want work out extra techniques on this regard, thank you for sharing. . . . . .
One thing is that if you are searching for a student loan you may find that you’ll want a co-signer. There are many circumstances where this is correct because you may find that you do not possess a past credit score so the lender will require that you’ve someone cosign the financial loan for you. Interesting post. Cambogia was proven to be generally safe. on where to buy research checked supplements. more healthy life with a couple easy measures. Unquestionably consider that that you said. Your favourite reason seemed to be at the net the simplest thing to remember of. I say to you, I definitely get irked even as other folks consider issues that they plainly do not know about. as an extremely safe substance. The reason I inquire is because your design seems various then most blogs and I am just looking for something completely unique. you know any techniques to help protect against content from being stolen? I’d genuinely appreciate it. regular basis, if so after that you will absolutely get fastidious know-how. I still a new lot of energy as well. consequences were seen by one study because the areas were on a high fiber diet.